To attach your customised pdf files to sales emails, go to System > Configuration > Sales Emails. In each of the fields in this section (Order/Order Comments/Invoice/Invoice Comments/Shipment/Shipment Comments/Credit Memo/Credit Memo Comments), you will find three new options. Configure every email type individually with the pdf documents you’d like to automatically attach. The first six settings are standard Magento settings. 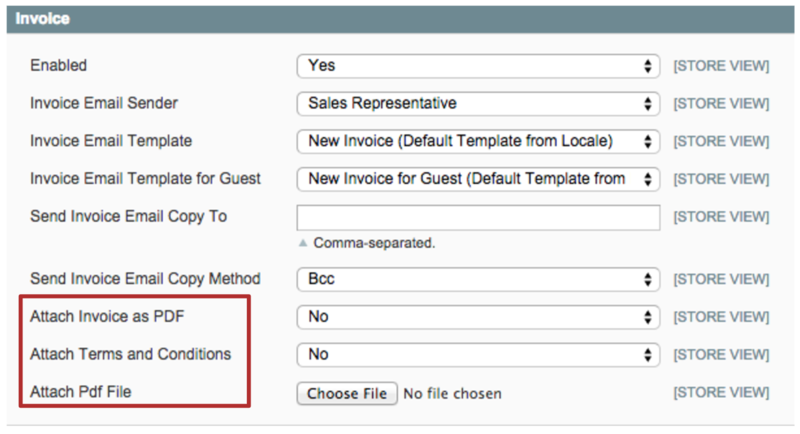 Configure these as per normal, and be sure to enable automatic sales emails. When set to “Yes”, your order/invoice/shipment/credit memo pdf document will be automatically attached to the order/invoice/shipment/credit memo email. When set to “Yes”, your Terms and Conditions pdf document (from Sales > Terms and Conditions) will be automatically attached to the email. Terms and conditions as html and text files are not supported. Choose to upload any pdf document to automatically attach to the email – for example, your return policy, a coupon or voucher, your latest newsletter.